Family traditions, Sicilian culture, and a Catholic Italian community are what it will take to continue to pass on a legacy of long-standing customs of the St. Joseph Altar. The purpose of this study was to determine if the necessary steps to carry on these traditions were adequate enough in today’s society. Therefore, a twelve-item questionnaire was issued to a participant as a pilot test to determine if the proper documentation was taking place for our future generations to follow. After reviewing the results, it was determined there are the necessary descendants to continue the practices of these traditions. Family traditions are a way of life for most Catholic Italian families, and passing on these traditions is extremely important to the culture. This qualitative research study looks at how family traditions are passed on to younger generations in today’s society as they relate to a St. Joseph Altar and the preparation methods to present an altar. Therefore, this study is looking at how older generations have preserved these traditions and how they will continue to pass them down to future generations. The research included publications that are relevant to the history of St. Joseph Altars along with valuable information provided by participants of St. Joseph Altars. Family traditions are customs, values, and ideals that are passed down to us from our parents and ancestors. In some cultures, family traditions are a way of life. It is a “time to relate or communicate with one another” (Hill, 2001, ¶ 5). By passing on these rituals that were handed down by ancestors, families are assuring that their way of life will carry on long after we are gone. The traditions are “the threads of life that bind us together as a family” (Hill, 2001, ¶ 1). By practicing these family traditions, the family unit is strengthened and closeness is increased. When practicing these rituals, families have the opportunity to provide an understanding of how important family is in today’s society. Older generations often wonder how their way of life will go on if future generations neglect to take up the traditions and customs. To understand the meanings behind a St. Joseph Altar, first you must know St. Joseph and know how the altars began. Joseph is known as the foster-father of Jesus Christ and the husband of the Blessed Virgin Mary. Joseph supported his family by his trade as a carpenter. He was a very religious man who believed that his family should always live by the laws that God commanded. St. Joseph is known for his special presence over fathers, families, workers, craftsmen, immigrants, and travelers. St. Joseph is the keeper of the “working class” (McCaffety, 2003), as he was so named by Pius XI. Pope Sixtus IV in the fifteenth century officially named March 19 on the Roman calendar as the feast day of Saint Joseph (McCaffety, 2003). St. Joseph lived a life of poverty, but he helped others as often as he could. The altar itself is in three steps to represent the Holy Trinity (Blessed Trinity), the Father, the Son, and the Holy Spirit. A statue of St. Joseph holding the baby Jesus is at the head of the altar, placed upon the top step. 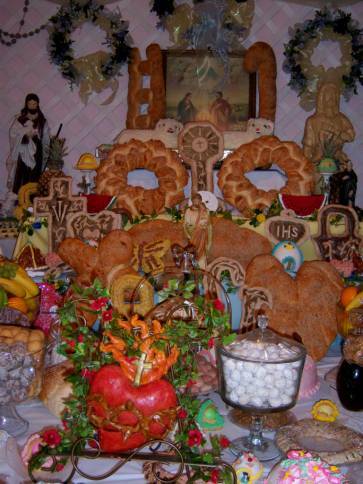 The entire altar is covered with Italian pastries, cakes, cookies, fried greens, seafood, breads, and candles. The altar is a meatless altar for a few reasons. “First of all, the feast occurs during the Lenten season, and this meal also serves as a reminder of the Last Supper” (L. S. Owens, personal communication, February 26, 2008). Research showed that diets of Sicilian ancestors consisted mainly of bread, vegetables, and fish (Owens, 2008). On the tiers of the altar, symbols such as the Monstrance (Spada in Italian) contains the Sacred Host of Jesus Christ. Other breads are placed on the altar to represent a significant aspect of St. Joseph’s life. The breads are shaped as a ladder, staff, saw, and hammer to represent his life as a carpenter. The Chalice, which represents the Consecration of the Bread and Wine at the Last Supper, is also placed on the altar. The Cross for the Crucifixion of Christ, Doves for the Holy Spirit, and Palms to represent the commencement of Easter duty are all made from bread dough. There are several types of cookies on the altar and each one has its own special meaning. A Pupaculova is baked cookie dough with a dyed Easter egg in the middle to represent the coming of Easter. 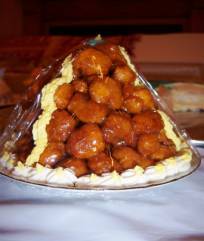 Pignolatti are fried pastry balls joined together in the shape of a pinecone representing the pinecone that Jesus played with as a child. An individual pignolatti represents the teardrops of Jesus. There are two lamb cakes placed on the altar to represent the Lamb of God. The majority of Italian immigrants in the Tangipahoa (Louisiana) area were descendants of Sicily . Most immigrated mainly because of extreme poverty and a drought that occurred in Sicily (Owens, 2008). Immigrants were attracted to Louisiana because of sulfur mines found in the early 20th century. Immigrants settled in Tangipahoa because of work in the strawberry fields and lumber industry. In 1880 a Census was the first to show seven Italian immigrants living in the fifth ward of Tangipahoa Parish. By 1890 there were 8 immigrants, by 1900 there were 97, and by 1920 the population had risen to 1,805. In 1920 the town of Independence in present day Tangipahoa emerged as the largest rural Italian community in the United States (Baiamonte, 1969). A St. Joseph Altar is a long-standing tradition that a small Catholic community in Southeast Louisiana continues to celebrate year after year. When the drought continued in Sicily, Italy, the people began to pray to St. Joseph, their patron saint, for rain (Owens, 2008). St. Joseph answered their prayers; therefore they offered St. Joseph this bountiful altar. Sicilian ancestors brought these traditions with them from Italy when they traveled to America in the late 1800’s (Baiamonte, 1969). After the Italian immigrants settled in Tangipahoa, they continued the traditions and customs that were handed down to them by their Italian ancestors. This is how the celebration of the St. Joseph altar began within Tangipahoa Parish. This research focuses on how the younger generations are taught by their mothers and grandmothers about the specific meanings behind this tradition and how these traditions should be carried on as their Sicilian ancestors intended. Figure 3. “Prayers were answered” by St. Joseph for participants of the altar. The Center for Southeast Studies maintains a database of interviews from 1985 to the present of individuals discussing the St. Joseph Altar. The interview documented in this manuscript is the beginning of a planned long-range study to expand the original interviews. This interview was with an individual who has participated in and organized several of the local St. Joseph Altars. Audio interviews were conducted to give the researcher one-on-one time with the participant. This also allowed the participant to provide historical information that can be stored at a historical site. A twelve-item interview questionnaire was utilized during the interview process. Questions were asked about the meaning of the St. Joseph Altar and the traditions that are passed down to future generations. See Appendix A. The interview lasted approximately fifty minutes and was conducted in the participant’s office. Audiotaping was used to aid in the collection of information, along with digital photographs. The participant was asked to sign a release form so that the audio recording could be used to collect the data and make it available to the public for further research purposes at a research center. After the interview was completed, the audiotapes were transcribed and placed on file in the Center for Southeast Louisiana Studies and Archives, which is located on the Campus of Southeastern Louisiana University. The interviewee explained how she had given several altars and participated in several more throughout her lifetime. She stated, “The altar was more of a personal fulfillment for me and what I was going through at that time of my life.” According to the interviewee the older generations preserved these traditions for decades, and it is the responsibility of succeeding generations to carry them on and teach their children how to participate in and present a St. Joseph altar. The St. Joseph Altar is a long-standing yearly tradition in a small Catholic community in Southeast Louisiana with roots to Italy. If this tradition is to be continued, it is imperative that the tradition be documented and preserved for future generations. This study is the first step in a planned long-range study to document and preserve this family tradition. Baiamonte, J. V. (1969). New immigrants in the south: A study of the Italians of Tangipahoa Parish, Louisiana (Southeastern Louisiana University). Hill, M. (2000). Family traditions. Ohio State University Extension Family and Consumer Sciences. Retrieved April 28, 2008, from http://ohioline.osu.edu/lines/facts.html. McCaffety, K. (2003). St. Joseph Altars. Gretna, Pelican Publishing Company. Owens, L. S. (2008, March 19). St. Joseph Altars. Spirit of Independence: The St. Joseph Day Celebration. Hammond, LA: Holy Ghost School. Have you ever given a St. Joseph Altar or participated in a St. Joseph Altar? What was your primary contribution to a St. Joseph Altar? How long have you been involved with the preparation of a St. Joseph Altar? Was there a special person or intention for which the St. Joseph Altar was offered? Why? When is the best time to start preparing for a St. Joseph Altar? How long does it take to complete all preparations for a St. Joseph Altar? What types of food should be prepared first for the Altar? 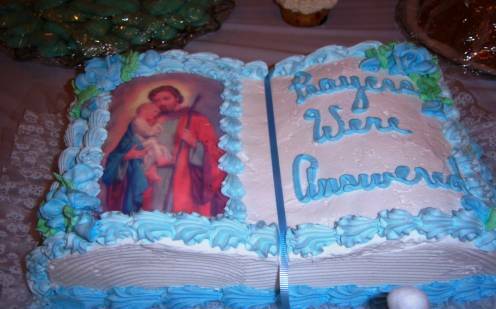 Are there any special dishes for which you are well known in preparation of an Altar? In the years that you have been involved with St. Joseph Altars, what stands out the most? How do you see the role of family in the St. Joseph Altar? Who are some family members that have worked with you on the St. Joseph Altar? You do not have to give names, just relationships. How important is it to you that your children and grandchildren carry on this religious family tradition? How can this religious tradition be passed on in families today? * Revised after the pilot test.